I just pu rchased your book, The RV Owner's Handbook; thanks for the wealth of information. I own a 27-foot recreational vehicle and am about to embark on the "spring shakedown" and want to re-caulk any external caulk with possible cracks or leaks, etc. I note you indicate remove all old caulking which would be a daunting task in terms of end caps, side molding, roof vents, etc. Can one simply clean the old caulking with denatured alcohol or some other product and then re-caulk? How does one tackle such a task? Thanks much! Mike, in my opinion, the crucial location where it’s important to remove all remnants of the old sealant is the roof area, specifically the perimeter and any seams. This is especially true if the existing sealant appears to be flaking. For trim moldings, compartment doors, windows, running lamps, etc., it’s not as critical, but aesthetics there, are important. Take a look at the ugly-looking sealing job pictured here. Even though this awning rail may not leak, it certainly can be made to look a lot better. 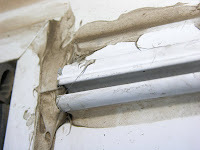 On sidewall components such as windows, for instance, you’ll still want to trim the existing caulking carefully with a razor knife and slant the blade slightly in to create a small cavity of sorts. Then apply a new bead of silicone or like sealant. Just a small bead is all that’s necessary. Wet your finger and press the new sealant into the cavity you created with the angle of the knife blade. In some cases I recommend taping off the area to keep excess sealant pressed out by your finger from spreading too far. If you trim the nozzle of the silicone tube very small, however, it can be done with less preparation. Neatness isn’t as critical up on the roof. Be sure to work the sealant in to all the cracks and crevices. If, however, the old sealant has become brittle and is flaking or peeling off, then it will be necessary to remove all of it and start over. In those instances, I would also remove the roof vent itself and put fresh butyl tape or Eternabond under the flange and re-secure it to the roof. The same process should be repeated for all components secured to the roof. And keep in mind, the type of roof, (aluminum, fiberglass, EPDM, etc.) will dictate other specific guidelines.